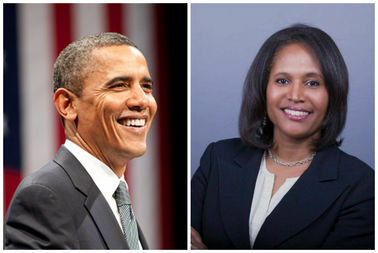 Former President Barack Obama Monday endorsed 4th Ward Ald. Sophia King, who faces a special election to keep her seat on the City Council. HYDE PARK — In his first political statement since leaving the White House, former President Barack Obama Monday endorsed 4th Ward Ald. Sophia King, who faces a special election to keep her seat on the City Council. "Michelle and I have known Sophia many years as a leader dedicated to improving her community. Over the years, Sophia has worked to make neighborhood schools and communities better," Obama said in a a statement. "Sophia is the type of leader Chicago and the 4th Ward need." Although Obama and the former first lady will remain in Washington, D.C., to allow their daughter Sasha to finish high school, the two are still registered to vote at 5046 S. Greenwood Ave.
"I am honored to have the support of President Obama," King said. "His time in office inspired me and many others to take the next step in working for our community by entering public service." King will face four candidates in her bid to keep her seat — Gregory Seal Livingston, Ebony Lucas, Gerald Scott McCarthy and Marcellus Moore. They are vying to fill out the remainder of the term of Will Burns, who resigned as alderman in March to take a job at Airbnb. King was appointed by Mayor Rahm Emanuel in April to serve as alderman until a special election could be held, now set for Feb. 28. In December, King joined the Council's progressive caucus — which frequently opposes the mayor's initiatives. King, founder of the nonprofit Harriet’s Daughters, also worked as a teacher and Chicago Public Schools administrator and is a longtime friend of the former first couple.